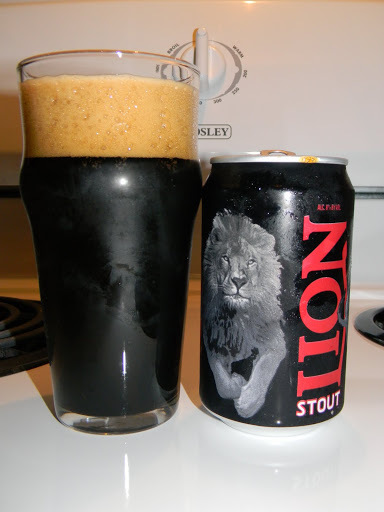 Review of Lion Stout | Beer Apprentice - Craft Beer News, Reviews, Interviews and Info. Hey guys!!! I hope everyone is doing well. I need to apologize to you all for not posting any beer reviews over the last few days. I had the misfortune of witnessing my computer completely blow up on Friday afternoon as I was about to post a review. I’m hoping to get it back by the end of the week, so for the time being, I’m going to be using a “borrowed” computer to add a few posts. Please bare with me over the next little bit as I get this problem sorted out. Now, back to the beer review. Today, I’m going to share with you my experience in sampling the Lion Stout from the Ceylon/Lion Brewery Limited located in Biyagama, Sri Lanka. I have only tried one other beer from this brewery (the pilsner), so I’m not sure if I’ve made up my mind on what I think of them as a whole yet. The website, lionbeer.com, is “under construction” at this time, but I was able to find a commercial description from ratebeer.com. This Stout had an ABV of 8.0% and I poured it from an 11.2 oz. can. The beer appeared black with a faint ruby outline across the edges. A well sized, medium tan colored head was nicely formed. It was creamy and soft, however the retention was only average. The lacing was good and the cap quickly settled to a fine film. The aroma started with a significant roasted coffee bean fragrance mixed with fruity tones of prunes and dark cherries. A decent amount of dark chocolate swirled through along with a satisfactory earthy hint. The most minute hint of smoke was detected. Of which, completed a rather pleasant, suiting and well balanced aroma. The taste nearly matched the aroma to a “t.” Well combined flavors of roasted coffee, dark fruit and dark, bittersweet chocolate. A bit of bitterness was found, but not too much really. The smoke’y’ flavor was even noticed as well. At 8.0% ABV, I found no discernible distraction or taste of alcohol. Again, well balanced and even. The mouthfeel was a very solid medium. It was smooth, slick and dry. It left an adequate amount of flavor on the palate and it provided a decent amount of warmth for the throat. Overall, I thought this was a pretty good “little” Stout. It had ample flavor, a very attractive look and a sufficient aroma. It’s not the best Stout that I’ve ever sampled, but it was sturdy, solid, easy to drink and most enjoyable. Worth a try for sure, if you are a Stout lover. Once again, I apologize for not posting over the last few days. I hope you all understand my predicament. Hopefully, I can get back on track and start posting daily again. I may have a hiccup or two until I can get my computer back, but just so you know, I haven’t left or stopped reviewing.